It's nice to see Engelland's first fight of the year. Engelland is widely considered one of the better fighters in the NHL. In fact, former NHL enforcer Jim Thomson selected Engelland as the best fighter in the NHL, noting how smart of a fighter he is, and calling him 'the hardest puncher by far.' Engelland going 6-2 last year fighting Sestito was hardly the start I wished for his first tilt of the season but I'm guessing Deryk was asked and obliged. 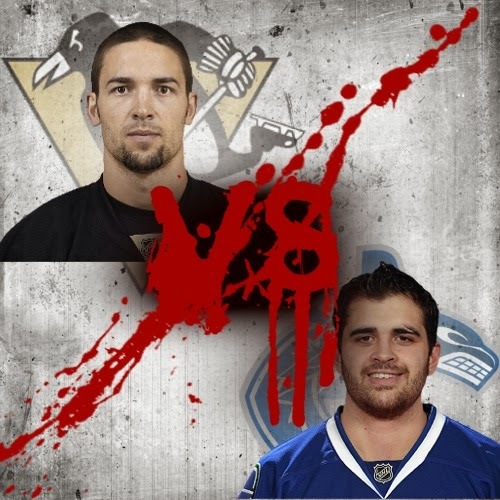 Tom Sestito is one of the worst "heavyweights" in the league he always looks for the safe fight and rarely wins. He is always good for one sloppy staged fight and the second the odds don't go in his favor he bear hugs and tackles to end to fight using his sloppy 200lb frame to fall on his opponent. This fight happened off camera so I'm guessing it was a mutually agreed upon fight. I'm not sure why Sestito would challenge Engo because it was a fight he was going to actually have to defend himself in. Engelland, different from Bortuzzo and Glass, loves to grab his opponents left arm and use his rights to attack. Engelland is also a patient fighter who will let the other guy punch himself tired at the start of the fight before counter attacking. Sestito gets a few shots to the helmet and a body shot before Engelland starts picking him apart with rights. Deryk lands a nice hook to the face and ends up getting in close to tie up Sestito's right arm. Tom slips out and lands a solid punch to Engo's face and Deryk counters with a few more rights. Sestito knowing that he won't get his right arm free bear-hugs Engo to end the fight and pulling him to the ground. If you're going to challenge a guy to a fight at least see it through to the end.